Now I'm going to add tabs instead of the spaces and get this result. Not really the look I'm going after. I'll add custom tabs to these lines. 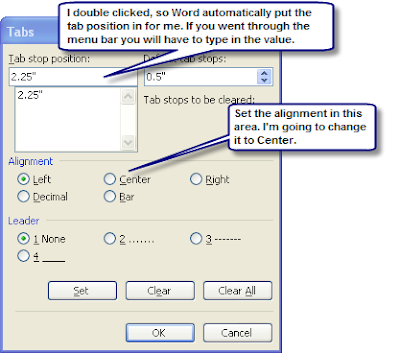 To do this select all of the lines and double click up on the ruler or go into Format => Tab on the menu bar (don't have the latest and greatest Office program installed to see where it is on the Ribbon). You can also move the tabs by dragging them in the ruler. They are the black characters on the ruler that look like a backwards L (alignment Left), an upside down T (alignment Center) and an L (alignment right). You can add multiple tabs to one row. This feature also works great for headers and footers if you want text both right justified and left justified. This information is by now (June 3, 2009) out of date -- does not apply to the newest version of MS Word. It still works in the current version. You may have to go to the view portion of the ribbon and check the ruler box to get it to show up.